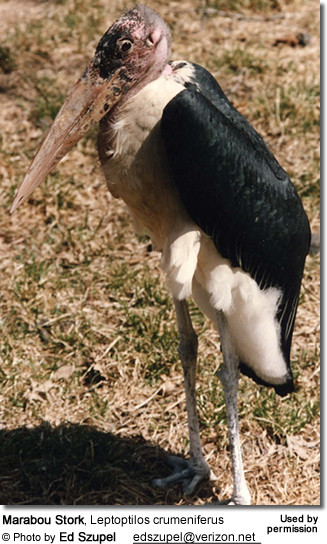 The Marabou Stork, Leptoptilos crumeniferus, is a large wading bird in the stork family Ciconiidae. It breeds in Africa south of the Sahara, occurring in both wet and arid habitats, often near human habitation, especially waste tips. It is a huge bird, 150cm in length, and its 3.2 m (10.5 ft) wingspan means that it shares the distinction of having the largest wingspan of any landbird with the Andean Condor. 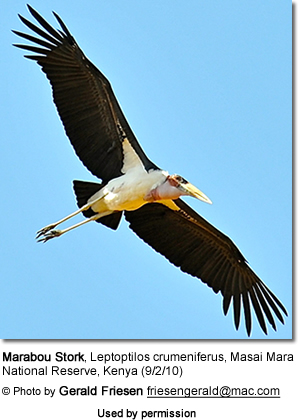 Unlike most storks, the three Leptoptilos species fly with the neck retracted like a heron. 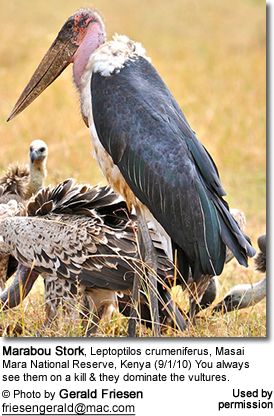 The Marabou is unmistakable due to its size, bare head and neck, black back, and white underparts. It has a huge bill, a pink gular sack at its throat, a neck ruff, and black legs and wings. The sexes are alike, but the young bird is browner and has a smaller bill. Full maturity is not reached for up to four years. It also resembles other storks in that it is not very vocal, but indulges in bill-rattling courtship displays. The throat sack is also used to make various noises at that time. This large and powerful bird will eat different kinds of animals, either alive or as carrion (dead animals), including small mammals, reptiles, and similar prey. Living prey includes termites, fish, locusts, grasshoppers, caterpillars, frogs, rodents, crocodile eggs and hatchlings, quelea nestlings, doves, young and adult flamingos, cormorant nestlings, and pelican chicks.